WALTER G. STERLING of Houston was appointed to the Board of Regents of The University of Texas System by Governor Dolph Briscoe in January 1975 to serve a six-year term. 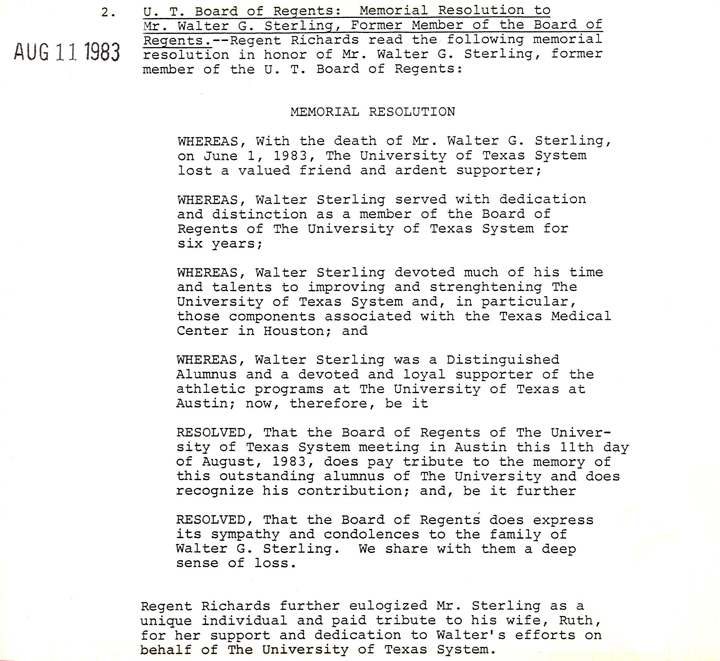 Mr. Sterling earned a law degree from The University of Texas at Austin in 1925 and has been active in the Ex-Students' Association, of which he is a life member. He is also a member of the U. T. System Chancellor's Council and serves on the advisory council of the U. T. Austin McDonald Observatory. 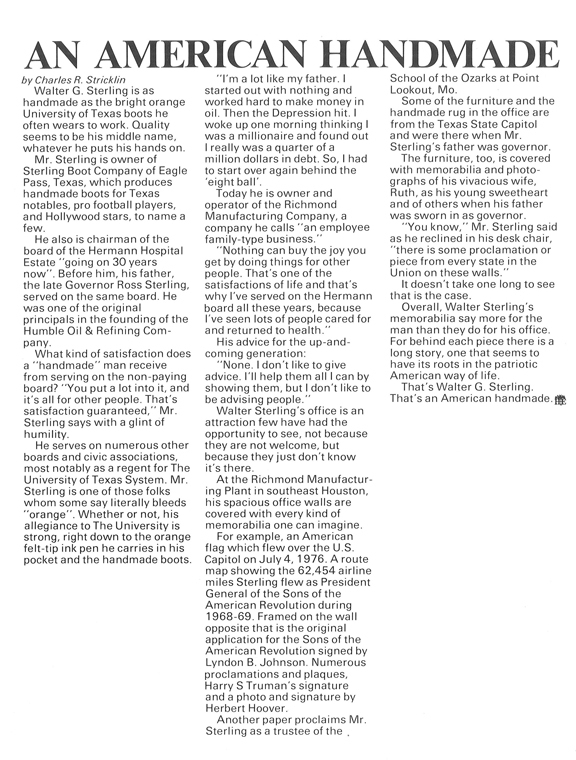 He is president of the board of trustees of the Hermann Hospital Estate and a director of the Texas Medical Center, Inc. A prominent businessman, Mr. Sterling is president of Royalty Properties, Richmond Manufacturing Company, S. H. Oil and Royalty Company and the Real Estate Corporation. He has held several national offices, including a vice presidency and President General (1968-69) of the National Society of the Sons of The American Revolution and is active in Houston and Texas SAR organizations. He was awarded a Minute Man Medal in 1965. He also is a member of the Sons of the Republic of Texas and Patriotic Education, Inc.
Mr. Sterling served as a member of the Texas Election Law Study Committee from 1962 to 1966 and was chairman of the Harris County Redistricting Committee in 1966-67. He was a member of the Harris County Democratic Executive Committee 1956-68 and served as secretary 1962-66. He was a member of the Texas Democratic Executive Committee and chairman of its finance committee 1960-62. He has several Masonic affiliations, has been chairman of the Association of Christian Schools and is a former chairman of the Houston- Harris County Tuberculosis Christmas Seal Sale. He is a member and past president of both the Lakeside Country Club and of the Petroleum Club of Houston.